I’ve downloaded a new app for my iPhone in order to keep track of my walking (you can use it for other types of exercises as well). 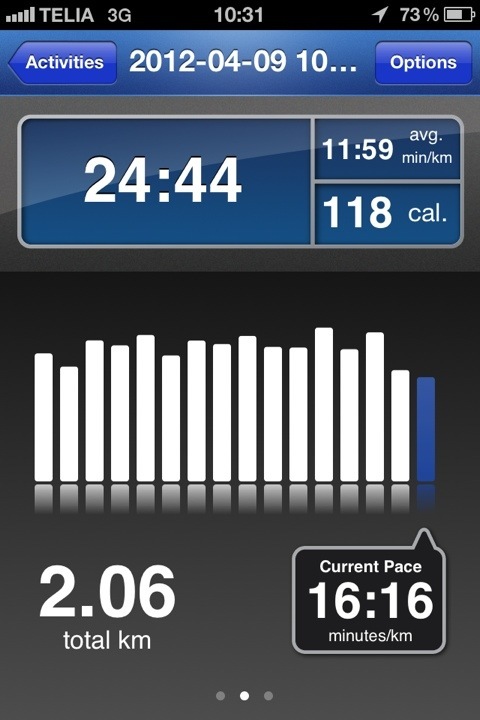 It’s a free app and you set up an account that is viewable both in the app and on the Runkeeper website. The app exists for both iPhone and Android. I’ve seen several of my friends on Facebook use Runkeeper as they post their records there. You can configure the app to post to Facebook and/or Twitter. I have no plans to set that up though I only want to use the app in order to keep a better history of my walks and to see that I (hopefully) improve. You can also configure the app so it automatically start playing music. I need to create a playlist first with some upbeat and cheerful music! That should help me improve my walking I hope. So far I’ve only used it once but it seems nice. The last week in May I’ve signed up for Vårruset (5 km race for females) so I need to practice a lot during the upcoming weeks. I was a little disappointed with my walk today because I wasn’t able to walk my planned route. I noticed a bit into my walk that my ankle started to hurt and give me trouble and I didn’t want to push it too hard so I changed my planned route to a shorter one. At least better then nothing I suppose. Considering how much I was able to walk during our vacation on Madeira I wish I could have walked a little further. As today was the first time I walked since our vacation and the flu I suppose I shouldn’t think too much about having a bad walking day.